Not many yachts are as innovative as this Liebowitz & Pritchard–designed 157-foot aluminum motorsailer. Drawn by Pedrick Yacht Design, this sloop can sail well and motor at speeds of up to 23 knots; with its centerboard up, the draft is just under 7 feet, allowing it to enter anchorages normally out of bounds for yachts this size. A major design issue was how to make the higher-than-average freeboard and large deckhouse structures appear to be lower than they actually are. The solution reached by L&P and Pedrick was to integrate the hull and house in such a way that the superstructure “disintegrates” fore and aft with no clear beginning and end. 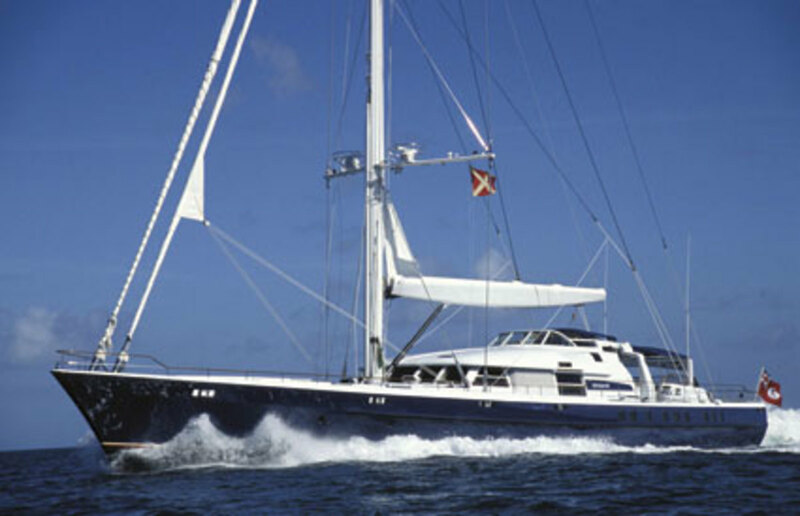 There are five cabins for the owner and guests, as well as accommodations for a crew of eight. The galley, just forward of the deck saloon, blends seamlessly with the crew’s dining area farther forward. The interior is meticulously designed and beautifully finished in anegre hardwood, varnished teak, American black walnut, and ivory-toned lacquers and leathers. The centerboard operates much like a dinghy board; it swings back on a pin into the hull, leaving a small amount of the forward edge exposed along the length of the hull to provide directional stability when the yacht is under power. A large hydraulic cylinder provides the leverage needed to raise and lower the board. Because the twin rudders need to be shallow when powering and deeper when sailing, Pedrick has fitted the boat with retractable carbon rudder blades in watertight composite housings.